For some people who suffer with acid reflux they may only experience symptoms at night or maybe their symptoms are simply worsened when sleeping. To help you understand why exactly this is the case let me explain further. If you suffer from acid reflux whether that is GERD or LPR the most common cause is related to the valve above the stomach which is called the lower esophageal sphincter (LES). When the LES opens up this allows the acid to reflux up the esophagus and for someone with LPR it can even reach their throat. The problem when you sleep and lay down is that there is more pressure on this LES muscle which often makes the muscle relax more and causes it to open – therefore allowing the acid to reflux up. 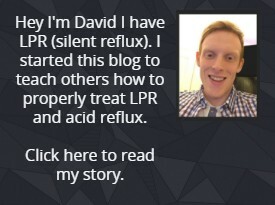 You can read more about the LES’s important role in acid reflux here. Luckily there are a host of things that you can do which should help with preventing reflux anytime you are sleeping or laying down. I will cover each of the points below. The most important thing to help with preventing nighttime reflux is undoubtably to not eat soon before bedtime. As I already mentioned the LES muscle which sits above the stomach is more prone to opening when there is more pressure on it. When you lay down the pressure builds because you don’t have the advantage of gravity keeping the food/acid down and inside the stomach. If you eat and lay down this pressure will only be increased because of the food being inside the stomach so this is something you want to avoid. Ideally you want to wait until all food has been digested and your stomach is completely empty before laying down. You should allow for at least 3 hours after eating before laying down/sleeping and ideally if you can 4 hours. In this case the stomach should be completely emptied which should drastically lower the chance of reflux. When I say to consider elevating your head I mean to raise your head and the upper part of your body up. The point of this is get the benefit of gravity keeping the acid down and inside your stomach. If your upper body is slightly slopped this will help and should lower the chance of acid refluxing up. There are a host of ways you could do this. I personally I have tried propping up with pillow, adding wooden blocks to raise the top end of my bed or even placing the wooden block under the top side of the mattress. Out of these options the best I would say is the wooden blocks under the mattress though still that isn’t as effective as a wedge pillow which is what I use now myself. A wedge pillow is exactly as it sounds, and I think it’s the best way to prop yourself up with a consistent gradient. You don’t have the downsides with a wedge pillow like with other options. For example, with pillows they don’t hold their form or when using blocks is can be uncomfortable for your back – therefore I would recommend getting a wedge pillow. There are a host of different options out there but generally speaking you should try and get one with at least 6 inches height – the higher it is the more effective it should be at preventing your acid reflux problems. I would recommend this wedge pillow which is 12 inches high, this is a high one that has is comfortable and well made. If you would prefer a smaller option I would recommend this one – it’s the one I am currently using myself. Just like eating, drinking before bedtime can make your reflux worse. Of course, because liquid passes through much more quickly than food it not often mentioned but for someone with bad nighttime reflux it should be considered. If you are drinking something soon before bed (less than 30 mins before) I would advise just to drink water. This way if you do lay down and there is some form of reflux then the water shouldn’t worsen this effect unlike a most other drink choices like soda, alcohol or juice. 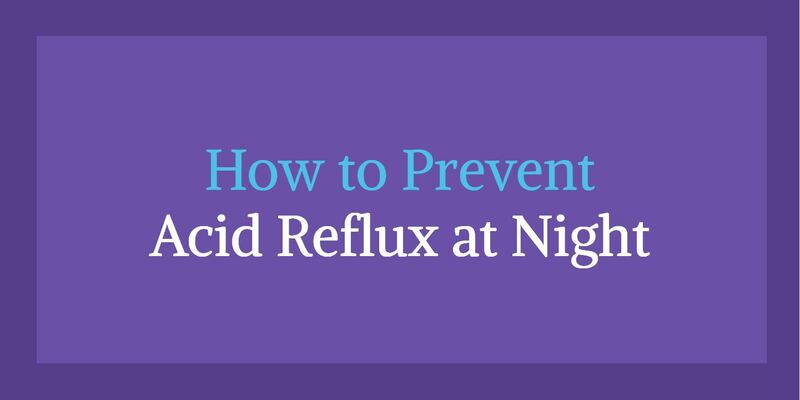 Believe it or not sleeping on your left side should help lower the chance of acid reflux. It is the best position to sleep if you are suffering from nighttime reflux. In fact, there was a study done to compare sleeping on the left side when compared with sleeping on the right side. It concluded that the total number of reflux occasions where higher for someone laying on their right side. While the reasoning is not completely understood some sources suggest that it could be because laying on the left side doesn’t affect the LES muscle as much as laying on the right side in comparison, which reduces reflux. Of course, for a lot of people the first option to helping prevent nighttime reflux is medication. Medication can help but often following the suggested steps I made above should be more effective than any medicine. It’s quite common to take an anti-acid like an H2A (H2 antagonist) or one supplied over the counter though their benefits are often comparable to propping up your head – therefore they wouldn’t be my first choice. The medication I would suggest is Gaviscon or ideally Gaviscon Advance the UK version. Basically, before bed you would take 2 tea spoons and the Gaviscon will help create a layer above the stomach which can help prevent reflux. Though ideally if you can I would recommend getting Gaviscon advance the UK version. The reason I clearly suggest the UK version is because it has an important ingredient called alginate. If you didn’t know alginate comes from seaweed. The main benefit of taking is that it creates a very effective foam like barrier on top of the stomach contents which is great at preventing reflux. In comparison the us versions have a much lower quantity of it which means they are much less effective. Luckily if you are based in the US you can order the UK version on Amazon here. Next articleAcid Reflux Sore Throat – How Long Does it Take to Heal?